Posted August 21, 2017 by Roxanna Brock McDade & filed under Border Crossing. 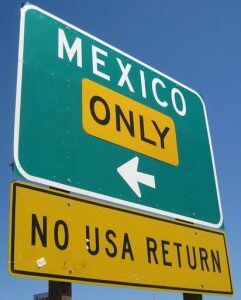 There are only three border crossings into Mexico from New Mexico, and all cross into the Mexico state of Chihuahua in the western half of the state. If it’s important to you to be able to get to the border quickly and get on your way to your Mexico destination, it may be worth your while to know what roads to take (both going north and south), what services are available and how busy the crossing. Save time by getting the low-down from Mexpro. Hours: 8:00 a.m. to 4 p.m. everyday. Banjercito open 8:00 a.m. to midnight, seven days a week. Hours: 6:00 a.m. to midnight, seven days a week. Claims the shortest lines on the border. Check border crossing wait times on the U.S. Customs and Border Patrol website to make your trip even faster.